Josh Cuthbert of Union J was originally supposed to be in The Wanted - Oh No They Didn't! Jayne Collins, the Wanted’s former manager, approached Josh Cuthbert to join The Wanted. He met the boys and was supposed to be in Tom Parker’s place. Problem was he was signed to a two year contract with his former band, Replay. He still had a year left of his contract and his parents spent a lot of money trying to get him out of the contract, but it just didn't work and he missed out on the opportunity. Click here to see the video of him talking about it since it's a tumblr video and I have no clue how to embed that. I"m loving this new surge of boy bands now. What are you favorite songs by them? I hope JLS gets some attention soon. lmaoo wait who's the "hot one"? lol, so not surprised. a bland boy band member for a bland boy band. what are you making your judgment on them being bland off of? have you watched any of their interviews? who, The Wanted or Union J? I've watched interviews of both, and find them bland tbh. 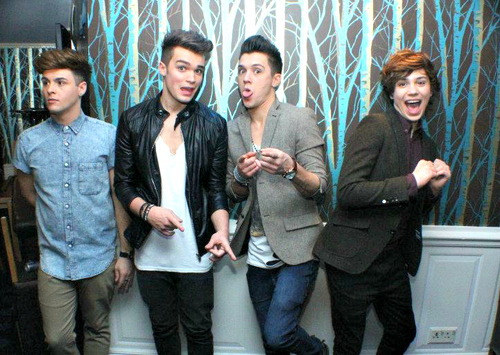 Jaymi's the only one from Union J I find interesting/talented, and that's one more than The Wanted. The one in the leather jacket looks like Adam Lambert morphed with Chris Colfer but somehow it works. yikes i won't be able to unsee that now. not sure if it works though...he still looks like a wax figure to me. Dodged a bullet TBH. The Wanted have been a mess lately. I'm talking about the past year. They were on the war path for a long time, then they were good for a bit, and now I don't see good things coming out of this whole lilo situation. lmao tom parker is awful, i'd rather have this kid. that being said, i think it's better he's in UJ. His name is George Shelley and he's 19. Go ahead and love him, bb! He's cute and funny! ia, not here for that essex quiff he goes for all the time tho. 1D are the cute ones, the Wanted are the ugly ones and Union J are the 1D knockoffs with budget Harry. Now you can tell them apart.